Looking for an easy quilt to make? 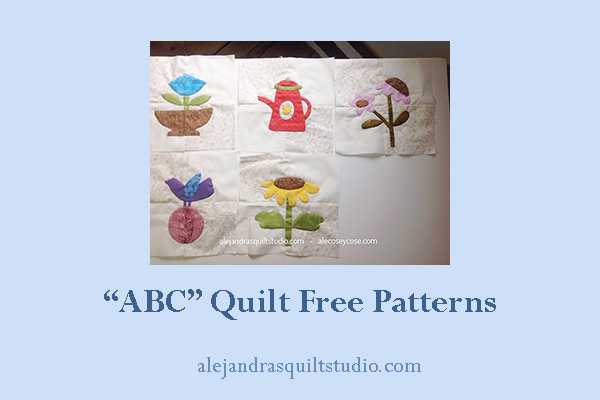 today I have two free patterns for you to keep working on for your new quilt. Looks like I got a name for my quilt! It just happened! I was working on Corel Draw program to get the new patterns ready for you, when it was the time to name the first pattern and the program asked me for a name to save the PDF, as this is a quilt for beginners who want to learn how to quilt but advanced quilters can make it too, I just typed ABC Quilt! Now that I got the name for this quilt, it will be easier for you to search on the internet for new patterns so you can keep working on yours. 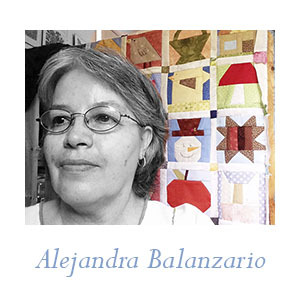 But if you really don’t want to miss a pattern you can follow me on Facebook at Alejandra’s Quilt Studio Fans Page or Pinterest. Today I won’t keep you long here, as I think all you want to do is to download the two new free patterns and after that you will be working on these new two blocks. 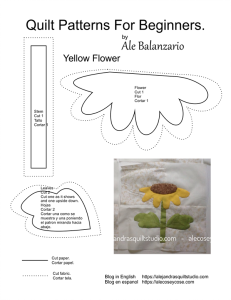 This block will give you the opportunity to work on it with the basics of applique. It has a stem that you will cut on the fabric with no need to cut it with your scissors as a bias, this will help you to work easier while you work on the applique. Once you have the fabric cut for the stem, mark on the block with a fabric pen a line where the stem should go, place the fabric on it, and place two pins or make some running stitches to hold this piece in its place while you work to do the applique. You can work now to cut the flower template and this time this template is not good to work with it with the paper template inside the fabric, I will suggest you just trace the template on the fabric and mark the shape of the flower with a fabric pen, cut the fabric adding 1/4 for the seam. Place the piece on the block and use two pins or some running stiches to hold the piece in its place while you work on the applique. When you finish, remove the pins or the running stitches and now you can work on the centre of the flower and the two leaves. 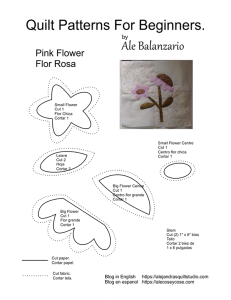 This is a block with two pink flowers. The first thing you need to do this block, it’s to mark with a fabric pen, the two lines where the stem will go, then work to applique the stems as you might know by now, you can watch the video here. One is like a little star, just the same as in nature, there are many flowers with star shape. The big one has more petals, but you will be working this time with one piece pattern, it will require a little bit more of skill from you at the time you work on the applique. The shape of this flower will be hard to be worked with the paper template when you work to applique it on the block, you can trace with a fabric pen the shape of the template on the fabric, add the 1/4″ and cut with your scissor, make cuts on the fabric to help you to fold the fabric inside. To cut the fabric for the second leaf, place the template upside-down on the fabric, and do the same as you did to cut the fabric and applique this leaf on the block. You can download the ABC Quilt PDF here, this pdf file has the three patterns together, so if you didn’t got the first one, well now you will have the three patterns together, as I think you have the first one as it has the directions to make each block for the quilt.